Welcome to Treginnis – our holiday cottages near St Davids make the perfect coastal location for your seaside break. We’re situated at the most westerly point of the St Davids Peninsula. This is a designated dark skies area of peace and tranquillity. Availability for Easter. We have two holiday cottages on offer: Y Nyth is the first, which is situated in the heart of St Davids. The charming cottage sleeps up to five guests, allowing you to explore all that this historic 6th century hamlet – designated Britain’s smallest city – has to offer. From Y Nyth, you can browse independent shops and upmarket eateries. Walk the 2 miles to Whitesands bay or visit the world-famous Cathedral, nestled in a grassy hollow beneath the tiny city. 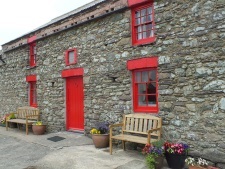 Ty Mortimer is the second of our holiday cottages near St Davids. It is located at Treginnis Uchaf, a National Trust Farm. Here, a more tranquil spot at the very western point of St Davids Peninsula. It’s home to the oldest volcanic rocks in the UK, stretching out dramatically into the Irish sea. From the peace and quiet of this idyllic spot, up to five guests can sleep listening to the sea. Wake up fresh and ready for walks on the only coastal National Park in Britain. Take a trip to nearby Porthllisky beach, or make your way 2 miles north to St Justinians where you can take a boat trip to Ramsey island. West of St Davids, Pembrokeshire on a National Trust organic sheep working farm. Spectacular sunsets and ideal for dark skies. Comfy large sofas with good mobile coverage. Coastal path close by. Stay at Ty Mortimer holiday cottage, St Davids Book now . NEW FOR 2019 New Diner, kitchen and utility extension into the garden.Quiet area only 2 mins from restaurants, St Davids Cathedral, shops, with Off street parking. Secluded garden, day and evening sun. Wi-Fi.